Oh, it’s complicated. Start with one animal lover, determined to become a vet. Life happens. End up in Environmental Education, and then in a stunningly remote area of the Appalachian mountains. Hand-built log cabin, a hundred acres…dogs, wood stove, and endless tromps in the woods together. Enough people to generate lost and dumped dogs, not enough to have a shelter, so UPS would drop dogs off at our place for rescue. And with the vet hours away, I found myself dealing with mange, broken bones, snakebite, varmint damage…even gunshot. I eventually shifted to Southwest mountains and turned my trail riding into Lipizzan dressage and the dog activities to competition sports, but really those early days are the core of what informs my writing. Mountains, wilderness, dogs, horses, and a side of smarty-pants. Tell us a bit about your latest book…? The Dale & Sully mysteries are like most of my books--they color a bit outside the genre lines, and they’re as much about Dale and Sully and Laura as they are about the mystery. The series started out as one of those Dreaded Publishing Stories–Big Name Publisher gave Editor the Stamp of Approval to develop the series, and then forgot about it. Which in a way is fine, because it meant I could go ahead and color outside those lines. Are any of the characters based on real animals or people? I don’t tend to do that, except… when I do. Which is to say that like for most writers, certain people or animals might serve as the inspiration for a character, but once the character is conceived, all bets are off. In fantasy A Feral Darkness, Druid was an amalgam of two of my Cardigan Corgis–one sweet boy who was functionally autistic due to brain injury at birth, and one who had a panic syndrome. What, I thought, if there was a mystical reason behind those behaviors? But I would still never say that Druid was based on these dogs…only inspired by them. I generally have a lot of irons in the fire. I’m working on a Nocturne paranormal proposal with my own brand of werewolf, as well as the third book in the Reckoners trilogy (paranormal). I’m plotting out book three for Dale & Sully. And I’m getting ready to start first draft on the next Nocturne under contract (shapeshifters!). Actually, since I had to do a big red tape paperwork job this week, I’m also desperately trying to get my web site and blog details up to date. I’m pretty good with it–all the big pieces are where they should be–but there are always little housekeeping tasks that creep up. And I’m trying to get a running rafflecopter giveaway in play at the blog, since those seem pretty fun. There should be one there now, I hope. Tell us about your pets, or other animals that inspire you. My guys do more than inspire me; they keep me grounded. Along with training the dogs I also bike with them, and at his age Duncan is more about easy trail rides mixed with foundation dressage than hard training. 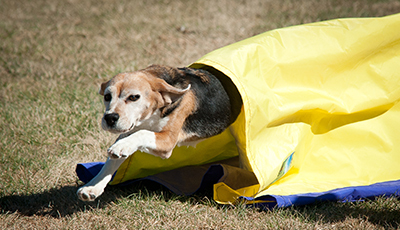 Connery is my oldest Beagle and is the second most titled breed champion Beagle in the States, as well as the first to reach both MACH3 with a VCD1 (titles in obedience, tracking, and agility). 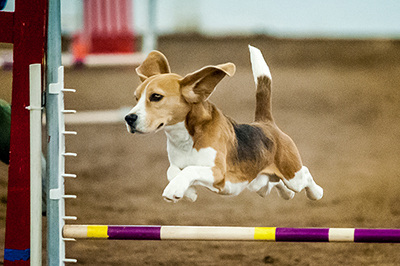 Dart is in the most exciting part of his various trialing journeys–on his way toward advanced titles in agility, rally, obedience and tracking. Rena Beagle is fostering and has earned some titles along the way while I unravel her health tangles. I blog about them all constantly! What advice do you have to offer to an aspiring author? At Least It’s Not May Ready, Set…NO!